The fall TV season gets kicked into high gear this week, with the debuts of several returning favorites and some of the most anticipated new shows. One of the most buzzworthy series' this year is the ABC drama Last Resort, created by Shawn Ryan (The Shield) and Karl Gajdusek (Dead Like Me). The show takes place on a nuclear submarine, the U.S.S. Colorado, which is faced with a harrowing order to fire a warhead against Pakistan, a country with no nuclear capabilities. 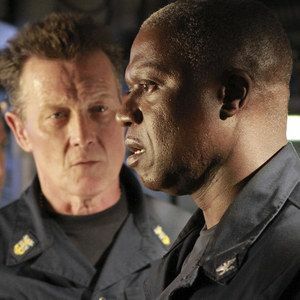 When Captain Marcus Chaplin (Andre Braugher) refuses the order, they are fired upon by their own country, forcing them to seek refuge on a small, exotic island. You can CLICK HERE to watch the full pilot episode, "Captain", before it debuts Thursday, September 27 at 8 PM ET on ABC. Shawn Ryan and Karl Gajdusek recently participated in a conference call to discuss Season 1. Since the show is set on the remote island, the submarine parked outside of it, and in Washington D.C., Shawn Ryan spoke about how much of each location we will see throughout the season. "What we've talked about is probably 60% of the action will take place on the island; 20% on the sub; and 20% D.C. Now, some characters can be fluid. Obviously, characters like Sam and Marcus will be on the island and on the sub. Sometimes there might be some communication with people in D.C., et cetera. So there's a fluid (basis) to this, but we'll be on the island a lot. We are definitely going to use our submarine going forward. And we're definitely going to play up the D.C. thing. Now, we don't want to get too formulary with the show, so not every episode will match up to pie chart. But that's in general pie chart that covers the whole season, I would say." Karl Gajdusek spoke about his love for the submarine genre, and taking it into the 21st Century with this series. "I had a love of submarine stories from early on. My father had books and books of subs in the South Pacific all over our library at home. I always love the submarine genre and some of those fantastic tension-filled sub films like The Hunt for Red October and Crimson Tide. And as I start to think about what a show could come about it, it would take in that sort of tension sub genre. I think more about what the modern day holistic missile submarine is, a realization that one of these submarines is such a powerful weaponry, piece of machinery that anyone who owns one really could plan a flag and say, hey, I am new small nuclear-armed first world nation. That was sort of the gem of the idea. Once you've sort of say, okay, that's the premise, then, you know, that's about the time that I came to Shawn and we said, can we make a show about this? And we started to come up with, okay, what - who would the principal characters be and what would the story by that would separate a machine like this and the people who command a machine like this from their homeland. And one of the things that was really important to us as we develop the show was the section at the middle of the pilot where the crew or the captain, I should say, questions the order he receives to fire because the last thing in the world he wanted to do was take a show about - a group of military people who've sworn an oath to sort of - to push that button when the time comes and then say, okay, well, in this day, it just didn't feel like it or they had a crisis of conscience. So we work very vigilantly to make sure that the plot points around that section would hold water be something where military people also would say, you know, what, I might question that order as well." Shawn Ryan also spoke about the logistic difficulties of shooting a TV show on a submarine, and how that will get easier throughout the season. "They're all difficult. The submarine, you know, it was more difficult I think for the pilot that set has to be built. Now that it's built and we're understanding the best way to film it I think is going easier every episode. Our production offices are in Los Angeles. We brought it and edit here, but we're filming in Hawaii, so our set is five hours away. It's a three-hour time difference for half year, and two-hour time difference the other half of the year. So you've got some separation there. You've got a big sprawling cast that we're trying to service everyone, so like the stories that are coherent. You've got action taking place on a fictional French Polynesian island. You've got action taken place in the D.C. area; action in the Maryland suburbs where Sam's wife lives. And additionally, you have a lot of special effects and visual effects, and you reference the water. A lot of subs you see in the water and the pilot - you know, things were filmed sort of in around the water and then visual effects later. And so, that requires really being - really giving a lot of lead time to our special effects team. And to do that, the scripts need to be in early. You need to know what you're doing in episodes so that you can start planning with these people a month and a half, two months ahead of time so that they can get the work done. It's not something where you can just decide on Wednesday, well, we're going to write some scenes that we're going to shoot on Friday because - you know, because it's just a hospital set and we're always there and we can change it. You know, we really need to have a very firm plan. You know, we need to fly a lot of actors from LA to the Hawaii, you know the acting pool in Hawaii isn't as deep as in L.A., or Chicago, or New York. So you've got to plan ahead. You've got a lot of characters who are recurring, who are going to span over a certain number of episodes and you've got to manage that. And then to serialize show where things are changing week to week, and you've got to be able to keep track of all that story while it isn't - and yet stay ahead of the game so that you can meet your production schedule. So that's what I mean by it'd be very ambitious. And then on top of that, we're trying to tell great big stories with great big scope. So it's a challenge. And if we pull it off, I think it will be a great treat for the audience. And if we don't pull it off, you know, we'll be a very public humiliation on our part. So the stakes are high and it inspires us to do the best we can." Since the show takes place on an island, there will be inevitable comparisons to ABC's hit Lost. Shawn Ryan revealed he is extra cautious not to tread into those waters. "I'm kind of the Lost police in the writer's room. When an idea comes up, I'll be the one that says, well, they did something kind of similar to that in lost, so we can't do it. So I frustrated some of our writers by being tough in that regard. So hopefully, there's enough of a similarity, you know, that's evocative of the great big hit on ABC while still being different enough that we can stand outside the shadow of a giant like that show and try to make our own way." You can watch Last Resort kick off the series with "Captain" Thursday, September 27 at 8 PM ET on ABC.